Spend the night prior to our Antarctic cruise in Ushuaia, the southernmost city in the world and the capital of Argentina’s Tierra del Fuego Province. With a population of more than 63,000 people, the city has grown, yet it has retained an easy-going and accessible feel. With the sea to the south and mountains to the north, Ushuaia is everything Patagonia is about and a spectacular departure point for our cruise. After embarking the Sea Spirit in the late afternoon, we sail down the historic Beagle Channel, which transects the Tierra del Fuego archipelago at the tip of South America. It is named after the ship that carried Charles Darwin on his historic voyage round Cape Horn and up the coast of South America to the Galapagos Islands, where his explorations led to his theory of evolution. We travel in the wake of explorers and mariners as we view birds, penguins, sea lions and snowy mountains. The next land we encounter will be the Antarctic Peninsula, the world’s southernmost continent. Sailing around Cape Horn was (and is) one of the most challenging nautical routes on the planet. On our journey, we will have the opportunity to cruise past this iconic headland on an epic rite of passage few have the privilege to experience. And as we enter the 500-mile-wide Drake Passage separating the bottom of South America from the tip of the Antarctic Peninsula, we can’t help but feel a spirit of adventure that is heightened by the vast ocean and the wild grandeur that lies ahead. 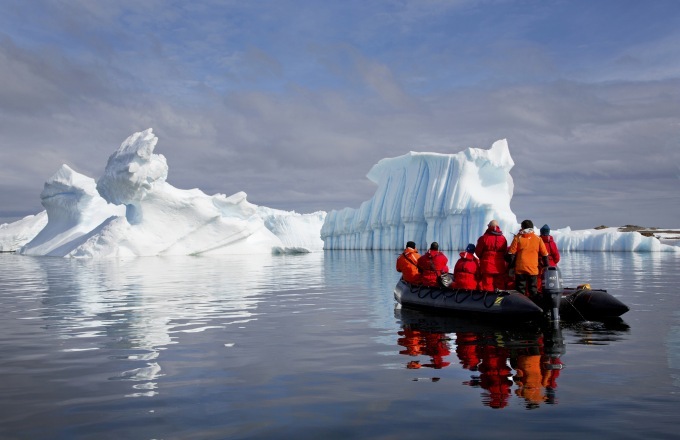 Entering the notorious Antarctic Convergence lends to the region’s spine-tingling thrills. This is the region of the Southern Ocean where the cold waters of the Antarctic Circumpolar Current meet and mingle with the warmer waters to the north. This intermixing creates local variations in weather (such as fogs) and high waves. Prepare for potentially rough water, but hope for a smooth sailing and keep an eye out for an abundance of animal life. You’ll spend these ﬁrst days getting to know your shipmates, while the ship’s crew provides safety brieﬁngs and insights into what lies ahead. When the Antarctic Convergence is left in our wake, we truly begin our Antarctic adventure. As we sail from island to shore to bay during our ﬁve days exploring the Antarctic Peninsula, the Expedition Team educates and entertains. We get up close and personal with wildlife on Zodiac excursions from the ship to daily landing sites. We visit penguin rookeries, scout for humpback and Minke whales and search for a number of the southern seal species, including the cunning Leopard seal. The majesty of the Peninsula’s mountains is enchanting as we scramble up snowy pathways to vantage points offering 360-degree views. We’ll visit Chinstrap penguin colony high on a ridge. And we’ll have the choice of going on a mountain hike or spending time with curious penguins as we relax on a pebbled beach. Those who are truly adventurous can even take the Polar Plunge don’t forget to pack your swimsuit! Amidst the peaceful silence of Antarctica, noisy interruptions become indelible memories such as penguins squabbling over prized pebbles, the boom and crack of calving glaciers in Neko Harbor, and the echo of voices bouncing off a giant glacier. The journey back across the Drake Passage provides us with some ﬁnal opportunities to enjoy the crisp Antarctic air. We spend time on the deck watching for seabirds and scouting for whales, enjoying presentations by our Expedition Team and relaxing in comfort aboard a ship perfectly designed for these waters. Upon arrival in Ushuaia in the morning, you will be transferred to the airport for your ﬂight home or on to your next destination. MEALS. Three meals per day on an à la carte basis, wherever available and practical, allowing a choice of anything on the menu, except caviar and alcohol. In those few places where à la carte is not available or practical, table d’hôte is offered. Where time and location permit, Travcoa’s DINE-AROUND PROGRAM is offered outside of the journey hotel. DINE-AROUND PROGRAM costs are reimbursed after travel from Travcoa’s corporate offices following review of qualifying expenses. Bottled water, soft drinks, coffee or tea are included with meals. TRAVEL DIRECTOR. The services of the Travel Director in all matters pertaining to the journey operation unless the journey is converted to a Private or Custom Journey. SIGHTSEEING. With English-speaking guide as shown in the itinerary, including entrance fees for places visited. Air-conditioned vehicles are utilized when available. 4X4 vehicles may be used in many locations as necessary, especially in Africa. Bottled water is included on sightseeing excursions. LUGGAGE. All transportation and transfer of two normal-size Pullman suitcases, except when mandated by charter air carriers or airlines. On some programs baggage may be limited. Traveler will be responsible for overweight charges imposed by an airline or air charter company. GRATUITIES. All gratuities to hotel, cruise, train and restaurant staff and local guides and drivers for normal on-journey services. Note: The customary end-of-the-trip gratuity to the Travel Director is not included. PORT TAXES. All port taxes on cruise portions of itineraries are included. TRANSFERS. Group or individual airport transfers on arrival and departure flights. MEDICAL EVACUATION. $5,000 medical expense and $50,000 Emergency Evacuation & Repatriation of Remains coverage for covered expenses if you suffer an injury or illness during the course of the trip. This plan is included in the cost of your trip and is provided through Travel Guard. May be subject to regulatory restrictions in certain locations. Gratuity to the Travel Director and other items not mentioned as being included. Three meals per day on an à la carte basis, wherever available and practical, allowing a choice of anything on the menu, except caviar and alcohol. In those few places where à la carte is not available or practical, table d’hôte is offered. Where time and location permit, Travcoa’s DINE-AROUND PROGRAM is offered outside of the journey hotel. DINE-AROUND PROGRAM costs are reimbursed after travel from Travcoa’s corporate offices following review of qualifying expenses. Bottled water, soft drinks, coffee or tea are included with meals. The ship has an ice-strengthened hull, Zodiacs for exploration and remote landings, generous deck space and advanced navigation equipment. The ship offers a superb guest experience with a nautical lounge, two restaurants, sundeck, and plenty of deck space for observation of polar landscapes, and lounges for learning and reflection. The ship’s interiors have a contemporary aesthetic that provides a bright and spacious feel to the cabins and common spaces. Endeavour is also the only polar adventure ship in Antarctica focused on health and wellness. From the newly-built saunas to the pool, gym, hot tub and wellness café with a juice bar, the ship offers guests onboard services and amenities that will enhance their Polar expedition experience. The ship also has a Polar Boutique, where guests can buy gifts as well as gear they might need for the voyage.